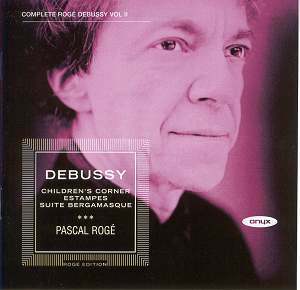 Pascal Rogé is now recording Debussy for the second time. His Decca cycle was much appreciated in its day. This time he takes an expansive, deeply considered view. On the whole I like my Debussy more volatile but all this is beautifully played and warmly textured. In the most important work here, "Estampes", the first of Debussy’s works which is wholly impressionistic in sound, Rogé’s timings are similar to those of the elderly Claudio Arrau. Yet, while Arrau is more interventionist and can seem mannered, he is ever the great communicator. There is all the mystery of the Far East in his "Pagodes" and his Latin-American birthright no doubt helps him to give a sinuous lift to "La Soirée dans Grenade". Furthermore, it is Rogé not Arrau who, in the interests of expressiveness, allows some hiccoughs in the gentle pattering of the raindrops in "Jardins sous la pluie", even robbing the closing page of its quivering excitement. Arrau mainly avoids this. With Arrau we also hear plainly that the pieces are respectively about three different parts of the world. Put on Gieseking after this and his "Pagodes" may seem manically fast and excitable. When you have taken time to adjust you realize it is Gieseking who more than anyone takes the notes of the page and creates sheer magic. It may seem perverse to stick with a recording made over fifty years ago but what else can I say? Some have questioned the supremacy of Gieseking in this music; my colleague Jonathan Woolf has had some interesting things to say on the subject. Well, some Gieseking performances are more supreme than others. His "Estampes" seem to me to show him at his most inspired, though I can accept Arrau as evidence that there are other ways. By the side of either of them Rogé seems a little pallid. The difference between excellence and greatness, I suppose. Elsewhere differences are smaller. In the first of the Children’s Corner pieces, "Doctor Gradus ad Parnassum", I wondered if any marginal advantages in Gieseking’s playing warranted the sacrifice of up-to-date sound. But as you get acclimatized, what pellucid light still hovers over those old recordings after so many years. In "Jimbo’s Lullaby" Rogé’s slower tempo makes the music sound melancholy. Gieseking explains better what Debussy meant by marking the beginning "doux et un peu gauche". He sounds like a child picking out the notes one by one. He finds a droll humour in the piece which I find more interesting. For once Gieseking is slower in the "Serenade of the Doll" and gives it an incomparable elegance. Honours are about even in "The Snow is Dancing" but Gieseking finds more character in the last two pieces. In early Debussy, Rogé is fluently attractive. I didn’t have a comparison for the "Suite bergamasque". I much enjoyed it though I have an idea I would like it all a shade faster. Full marks for not playing "Clair de lune" as if it’s the soundtrack to "Frankie & Johnny", but maybe it could flow a little more without gushing. In the "Ballade" he eases into each change of harmony in a way which rather draws attention to the fact that the piece is made entirely of two-bar segments. A more free-flowing approach might have hidden this. The Mazurka is nicely done. In the Arabesques the pianist on a disc claimed to be by Joyce Hatto is a little more upfront, finding more capricious humour in the second. Ironically, there have been suggestions that the "Hatto" version of the first Arabesque is Rogé’s own earlier Decca recording. "La Plus que lente" brings the only performance here I actively dislike, too slow and pulled-around. Gieseking is here too fast and unsettled. Which leaves the "Hatto" as the performance that succeeds perfectly in maintaining a gentle waltz movement all through, in spite of some quite extreme rubato. I look forward to knowing who the pianist really is. In "Le Petit Nègre" Gieseking is too impatient by far while Rogé is delightful. In general Gieseking’s versions of the less well-known pieces, which he rarely if ever played outside the studio, suggest all too brief an encounter. Altogether an excellent production, with recording and booklet notes by Roger Nichols worthy of it. But in the last resort not really memorable.